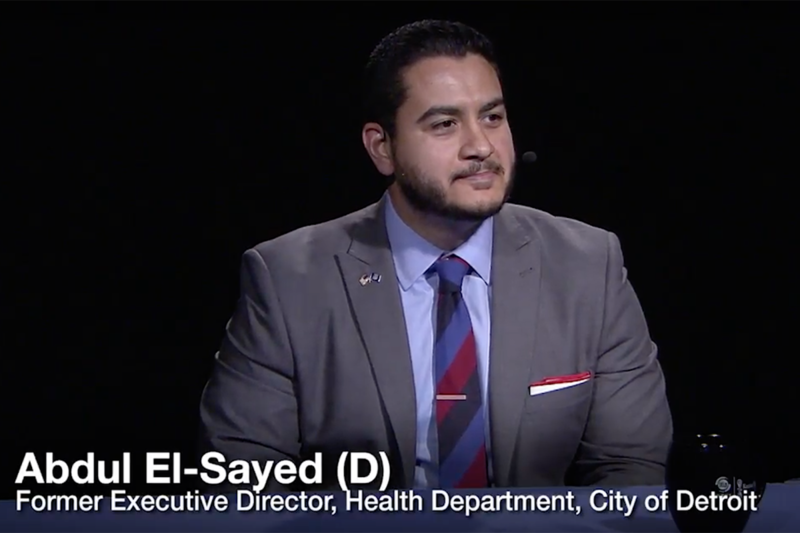 Abdul El-Sayed, the former director of the Detroit health department, says infrastructure and healthcare would be a priority. Dr. Abdul El-Sayed is pushing for free daycare, universal health care and a large-scale investment in infrastructure in his Democratic campaign for governor. Bridge Magazine interviewed El-Sayed, the former director of Detroit’s health department, for more than an hour last week along with its partners in the Detroit Journalism Cooperative: Detroit Public Television, Bridge Magazine, Michigan Radio, WDET Radio, New Michigan Media and Chalkbeat Detroit. What follows is a transcript of El-Sayed’s interview, along with timer mark to follow along with the above video. Any grammatical and spelling errors are those of the transcription service. Ed Moore, Detroit Public Television: Okay. I'd like to welcome Abdul El-Sayed. Did I get it right? Not bad. Thanks so much for taking part of our gubernatorial candidate interviews. I'm Ed Moore. I'm the director of content at Detroit Public Television. In the room today we've got six members from the Detroit journalism cooperative. They are going to be doing the questioning. The DJC is made up of six media outlets, Detroit Public Television, Bridge Magazine, Michigan Radio, WDET Radio, New Michigan Media and Chalkbeat Detroit. And we'd like to thank the John. S. James L. Knight Foundation for its support on this project. Today's panel includes, starting over at the left Sascha Raiyn, education reporter WDET and representing Chalkbeat Detroit. Riley Beggin, politics reporter from Bridge Magazine. Stephen Carmody, reporter and producer from Michigan Radio. Hassan Khalifeh, reporter for the Arab American News and New Michigan Media and Sandra Svoboda also from WDET FM. For the next hour each journalist will ask a series of questions and follow up on your answers if they need more specifics. We appreciate you keeping your answers as concise as possible so we can get through as many topics as possible. And I'll try to remember to give a 30-minute time reminder, so we can stay on track. Although, I haven't been too successful of that previously. Ed Moore: Anyway, let's get started. The first question I have for you is on leadership and responsibility. Now much has been made of the management style of the previous governors. The de facto head of party was strong-arm tactics of getting things done. Two, our current governor who has been criticized for not being as politically savvy, as he needed to be. First, can you explain what your management and leadership style is? Abdul El-Sayed: Ed, thank you so much for the question. I'm the only person in this race on the Democratic side that has any experience in an executive role in government and my role was to rebuild the Detroit Health Department after it had been shut down when the city was facing bankruptcy and emergency management. Coming into a role like this one has to understand the political maneuverings working with all three levels of government. Working with municipal government with state government and Federal government as well. As well as taking something from the ground up and building it. To me, I believe that strong leaders are people who can set a vision and then execute on the details with respect to that vision. Always thinking about how one builds a coherent constructive team and a culture that believes in itself and that believes in the vision it set forward. I'm really proud to have done that at the Health Department. I took it from five employees and 85 contractors in the back of the building where people pay parking tickets in Detroit, to five different campuses. More than doubled the size of the staff at the Health Department. Multiplied city funding for public health 10 times. And most importantly, set us on a path and our vision was that we would break down the barriers for kids to be able to learn and earn in Detroit like we would want for any child anywhere. To me, I believe in always thinking about the positive, always empowering my teammates and recognizing that real leaders are servants of the people that they lead. And that's the culture that I hope to bring to state government. A recognition that across this 50,000 person bureaucracy those who work in civil service haven't been empowered by their leadership for a very long time. And to me, my question will always be how do I help you do the work that you do because I believe in that work and the people of the state of Michigan deserve you to be your best civil servant. And that's what I look forward to doing at a state level. Ed Moore: Now as a democratic candidate if you are elected governor you will be the leader of the Democratic Party. Do you see it as your role to stay in lockstep with what the Democratic Party's agenda is? Abdul El-Sayed: I believe our role is to help set the Democratic Party's agenda. And I'll be clear with you -- I don't believe the Democratic Party has had a strong agenda for a very long time. I think we've been confused about what our responsibility is. And my responsibility as the de facto leader of the Democratic Party in the state of Michigan will be to set us on a path recognizing that our role is to be the champion of poor and working people across the state. To be able to put government in positions where it needs to be and take it out of positions where it doesn't need to be. And to recognize that the way we do that has as much to do with the process as it does with the product. So under my leadership the Democratic Party will certainly take a turn. Our responsibility will be honest about being that partner for working and poor folks across our state. And I think people will start to see a real difference. But we will be a lot more activist on the ground. To me, our whole campaign, we don't ask for corporate money. We're not all about running huge, big odds. Instead, we've made two times as many voter contacts as any other candidate in this race combined. And we know that if we can touch people and are having that conversation and we are looking people in the eye having conversations on the front porch instead of the back room that's when we succeed. And that's what the party will become under my leadership. Ed Moore: Okay, we've got several questions on education. And we are going to switch over to Sascha Ryain from WDET. Sascha Raiyn: Judith, in our audience wants to know about your plan for schools. So do you think Michigan schools have the resources they need to succeed? Do you think they are prepared to serve all students including special needs students? And do you think they are equitably funded? Abdul El-Sayed: So Sascha, thank you for asking Judith's question. Judith, thank you for a great question. We have a number of challenges with our public education system. And to answer the three that you asked specifically number one, we spend less per people per year on education than any other state in the Midwest. And I am not trying to be ___[0:06:23]. Number two, it's deeply inequitable. There is about a $780 pay gap per student per year between the highest income and lowest income schools. And that does not even include what's invested in the buildings themselves. I as a Health Director inspected city schools. I saw things like mice dead in the corner and they had been there for days. They didn't just die. Gym floors buckling because the amount of mold growing underneath them. And then when it comes to students with special needs we have fundamentally failed them. We've got a plan in terms of how we are going to be able to bring Michigan's education system forward. It starts with de-DeVossing our public education system. We have watched as Betsy DeVos and her ilk have moved lockstep through the GOP to defund public education and to create a system of for profit operated charter schools who have fundamentally nipped at the money that people like you and I pay to educate our kids putting that rather into company's back pockets. So number one, we have to create an off ramp for for profit charter schools. We have to change the way that we authorize charter schools so that there is one authorizer that has to get permanence from local school districts. Every board would have to have both a parent and a teacher on the board. Second, we have to reinvest in public education again. That means in investing in wrap around services like we did at the health department. Providing every child a free pair of glasses. It means making sure that kids have access to counselors. Right now, the national average students to counselors is 491 to 1. In Michigan it's 700 to 1. The number of librarians has dropped 63% since I graduated high school back in 2003. We have got to start reinvesting in the people who invest in our kids. That means also investing in our teachers. We have seen a pay cut every year for the past five years. And then when we think about what education means we need to make sure that every student graduating from our public schools is walking both paths an academic path and a career technical education path simultaneously and graduates both understanding their way around a tool and die shop and precalculus. And then, it's what we do on the CAPs as well. I'm a father of a, proud father of a seven month old baby girl and I know she's never going to be the learner she is today. Our capacity to learn in terms of the human drops precipitously over time and we're missing that crucial 0 to 5 age period. And that's why we want to invest in a program we are calling My Toddler. And My Toddler will provide every family access to early childhood education from 0 to 5 when they start kindergarten. And then it's what happens at post graduate. Too many young people are graduating saddled with huge levels of debt. And what we've got to do is provide every single child coming from a family earning less than $150,000 a year access to a tuition free and debt free pathway to a two or four public education in Michigan. We are calling that program My Scholars Grant. And the My Scholars Grant would empower young people to be able to pursue their education know that the State has got their back. And we know that if we have their back they'll have ours. And the most important thing we can do for our economy, which I'm sure we'll get to, is make sure that we are winning the competition for our talented young folk. And we've got to keep them here in Michigan if we want to thrive into the future. Sascha Raiyn: So we understand that tests often are measuring socioeconomic factors and then used in our accountability systems. Do you feel that Michigan's accountability system is measuring schools fairly and presenting parents with fair measurements of the schools and should then those accountability systems be used to determine whether schools are closed? Abdul El-Sayed: Look, I don't believe in closing down schools. As the Health Director in the city of Detroit, I talk to too many families who are worried about their schools shutting down at a degree to which that is going to interrupt their ability to live their lives is huge. Too many folks have to travel too far to get their kids to schools. We know that the system of "accountability metrics" just doesn’t work because it measures poverty. The best predictor of whether or not a kid is going to score high on that exam is unfortunately, what their family's income level is. So rather than this punitive system where we measure poverty and then fail to invest in low income schools. Instead, we have got to be asking about how we close the gap in terms of what schools get. And I didn't refer to this in my last answer, but right now there is a $780 pay gap. We have to close that down. The system by which we invest in school buildings that kids are learning in that has got to be improved. And what we are proposing is a system through our Pure Michigan Infrastructure Bank Proposal, where we would have a bank for school infrastructure. It would be funded by a statewide probably tax millage. And it would allow schools to use buildings they don't use, sell them off to the State, of course, with local approval and then be able to take the money and invest it in the schools that they do use so kids are learning in good and safe classrooms. But right now, the idea that somehow we should be measuring and punishing instead of measuring, understanding and empowering that doesn't make sense to me. So we have got to be thinking quite differently about how we assess. Now look, it's really, really important to hold teachers accountable, but I think the accountability has a lot more to do with the soft metrics of how a teacher is in the classroom and the way we are empowering. And certainly we shouldn't hold teachers accountable for the fact that we have disinvested in the means of educating a child in the first place and then ask them to be pulling superhero tricks in the classroom because it's just not fair. And that's the reason why so many young people don't go into education anymore is because they know it's punitive. They know they can’t make the same living they could have in the past and they know that they are going to be blamed for the failure of a system that has disinvested in schools. Ed Moore: Regarding the My Scholars program, how do you plan on paying for that? What's your plan? Abdul El-Sayed: So the state right now has about a $56 billion budget. If you were to trace down all of the money that we use to subsidize huge corporations in the state of Michigan it comes out to somewhere between 11 + billion dollars. That ends up being about 20% of our annual budget every year. And it comes down to deciding whether or not we as a state believe that the state's responsibility is to underwrite a huge number or in a huge way a number of corporations who have ultimately offshored or automated our jobs. Or the State's responsibility is to invest in people and places. I choose the latter. I believe our responsibility as a State is to invest in our people and to invest in the places they live, learn, work, pray, play. In order to do that that means investing in schools, investing in higher education, investing in infrastructure. The money is there. The priorities are not. And so, right now, the Michigan Economic Development Corporation, MEDC, I think has become a vehicle that has lost its way. And I think we have really got to be thinking about whether or not the investments we are making now are in the best interest of our community and the future of our state. So the money is there. The priorities are not. Second part of this though is also working with Michigan Public Education Institutions to talk about why the cost of higher education has gotten so high in the first place. And a lot of that is because of administrative cost. So I would love to work with our public colleges and universities to ask how can we start bringing down the cost of administration in our public colleges and universities? How do we make this more affordable over time? And in the interim, also start making investments both through the My Scholars Grant and also into baseline grants to our higher education institutions so we can meet in the middle. Because if we can't invest in our young people and we're not keeping them here we will not have the kind of economy we want for the future. And this is fundamentally about the future of Michigan. Ed Moore: Next question is more specifically about Detroit Public Schools and that comes from Steve Carmody. Stephen Carmody: You mentioned the need for improving school infrastructure. Detroit Public Schools community district is the largest in the state has a major problem in that areas. Recent report shows about $500 million is needed to upgrade the facilities in the district. But the district is constrained in its ability to borrow money to be able to make those kinds of repairs. You mentioned your plan on dealing with this on a statewide level. But when it comes to Detroit's issues does Lansing need to do more to help the city of Detroit or help the Detroit School District deal with this problem or can it at least make it easier for the District to borrow money? And I used to work with the good folks who oversaw facilities at Detroit Public Schools community district. And I'll tell you when we tested every single school for lead we had to, some days were not the easiest conversations, but we knew we had to get it done. But those folks work really hard with almost nothing of the resources that they have. And they are working with older and older buildings every year. Our program, this Michigan Infrastructure Bank and in particular the School Infrastructure Sub-bank, would allow our state the means of investing in lower income school districts that do not have the revenue capacity to invest in the school's buildings itself. This its he way we need to solve it. And what it does is it leverages the bank aspect of the school infrastructure bank to buy out the number of buildings that already sit in Detroit Public Schools but are not being used. And then redevelop them and then share the money that comes through that back into the school district to allow them to invest. This is a means of using what school districts have but don’t' need to build what they need but don’t' have. And that's why we believe this is such an innovative solution and would really benefits community school districts like Detroit's and many out state in some of the rural communities that face very similar circumstances, but just aren't as big and so don't get the same kind of attention. Stephen Carmody: Would the School Infrastructure Bank when it takes on these properties and then resells them would it resell them to say, charter operators or other competitive school operations that would then possibly drain away some of the students? Abdul El-Sayed: That's not what we are envisioning. Instead we were envisioning investing in redevelopments for mixed use. You can imagine mixed housing. You can imagine retail. You can imagine taking those buildings down and investing in manufacturing spaces. But not just turning them around and flipping them for a charter school. And like I told you, I don't believe in for profit charter schools and I would seek to create an off ramp for every for profit charter school, which would eliminate the financial incentive that so many charter operators have right now to building more and more schools that don’t really improve the educational capacity of the city or the state. Ed Moore: So charter schools have come up a couple of times now and I think Hassan is going to drill down a little bit further into this topic. Hassan Khalifeh: All right, so you talked about introducing accountability to charter schools, but what types of changes to laws do you think Michigan should make in how charter schools are governed and funded? Hassan Khalifeh: So it would be fair to say that you would continue -- you would support continuing funding of charter schools with money allocated for public schools? Abdul El-Sayed: If they were nonprofit and they meet those requirements. I don't begrudge communities who say well, we want to open a charter school that offers a certain extra set of learning for students or in communities that have you know, public schools, for example that are far away. Or you know, legacy charter schools that currently exist that move to a nonprofit model. Again, I'm not into shutting down schools, right? Because that really interrupts a family's way of life and unrightly so. But I do not believe that anybody should be pocketing the money that you and I pay to pay into our education system in tax dollars. Ed Moore: Topic of higher education has also come up so far and the cost associated with it and Sandra is going to drill down a little bit further into that. Sandra Svoboda: Yeah. I think we heard earlier from you that the cost of higher education is considered prohibitively high in Michigan. Looking for a little bit more on the specifics of how you would address that as governor to make it more affordable for people? Abdul El-Sayed: Let me tell you a story of a gentleman I met. He graduated from the University of Michigan in 1968 that's 50 years ago. And he told me about his tuition at that time was $750 and his cost of living was about $1100. So he could get a job and his job over the summer was scooping ice cream and he could afford not only to pay his entire room and board and his educational cost but a little extra on the side that he would enjoy with his friends. Right now, at the same university the in state tuition is going to be $15,000 this year. The cost of living to live in Ann Arbor has skyrocketed. Let's say about $60,000 on the low end. Now you are talking about $75,000, upwards of 75 to 90 really if you think about the inflation and the cost of housing. And I don’t know anybody who can make $75,000 in a summer, frankly. Especially not if their students. Especially not if they're scooping ice cream. Look, this is an investment we need to be making. And right now, we have got a lot of commitments that need to be made to subsidize big corporations over the next several years accounting for some concept that somehow these corporations have created jobs. They haven't. The past 10 years have shown us that our big corporations in Michigan have not yielded a net job. In fact, the Fortune 500 have not yielded a net job because of automation and offshoring. So the better investment here is to invest in our young people and then watch what they'll do. There is the means to pay for it if we are willing to have the priority of saying that our young people and their minds are worth more than the bottom line of some corporation. And that's a commitment that I'm making. And I look forward to following that through working together with the universities to bring down the inflation of their costs and also start investing in their baseline operations and the students who go to their campuses. Ed Moore: At the other end of the education spectrum one associated with cost is preschool and childcare also. And Sascha Raiyn has that question. Sascha Raiyn: You mentioned My Toddler. Can you flush out what that is and how that works and how you would make childcare and preschool available and accessible to people in Michigan? And if you think about if we were willing to do the work of investing in the workforce that its needed to be able to educate all of our young people between the ages of 09 and 5 there is a lot there. So I want to work with these collaborations. Be able to put some state money behind building the infrastructure and then leverage in early childhood tax credit to be able to empower families to pay for this. And then lastly, we talk a lot about the gender wage gap. So much of that is driven by the decisions that women are forced to make after they have had a child between the ages of 0 and 5. My wife is a resident physician at the University of Michigan and you know, childcare is a really, really hard thing that we think about. Fortunately, we have my mother-in-law who helps to take care of our baby girl. And she supported Sarah and I to be able to do the work that we're doing. But a lot of families don't have that. And right now we are forcing women and largely low income women out of the workforce to be able to take care of a child. Ed Moore: Okay. We are going to move onto a new topic, government. Before we get into more policy specific questions I did want to ask you about the inner workings of Lansing. So Michigan's term limit is going to cause a mass turnover this year in the Senate and particularly in the House. How challenging do you think the loss of institution knowledge is going to be? Abdul El-Sayed: I think the loss of institutional knowledge is important. That's not exactly what I'm so worried about when we talk about term limits. The problem with term limits is that it creates the incentive for every legislator to be looking for their next job because we know that this one has a clock on it. And because of that it empowers usually lobbyists and legislative staff over legislators themselves to be able to make a good decision. The analogy I always like to use on this one is the difference between a parent and a babysitter. A babysitter their short term incentives is get the kid to go to sleep. Right? And a parent is yes, get the kid to go to sleep but also make sure that the kid is healthy, happy and long-term safe and secure in their lives. And right now, under the term limits that we have there is very little long-term perspective that legislators carry with them. Usually, they are a lot more focused on the short-term, quick wins and in the long-term somebody else will take care of it. And so we've got to do something about these term limits. You're right though about the short-term. Right now, every single officer in state government is up for re-election. And there will be some huge level of turnover. But I am confident that the State right now is under so much pressure to actually deliver on the basic things that they haven't delivered on for a while that I do believe that we need new blood at the governor’s office certainly but then also at the legislature. I think the time is now to be thinking about how we finally make good on commitments we should have made a long time ago on things like fixing our schools and fixing our roads and fixing state government itself. Ed Moore: You are going to have a lot of new people there that maybe aren't used to the ways and inner workings of Lansing or used to a lot of these legacy problems that we are facing. How are you going to be able to work with them? What -- how are you going to engage them? Abdul El-Sayed: Well, I'll tell you this -- used to legacy problems means that you didn't solve in the first place, right? honestly, I want a new crop of leaders in there who haven't gotten used to sitting on legacy problems that they did not solve, right? And I think being able to work with a new crop of folks with new ideas and new perspectives gives us a much better opportunity to actually solve the problems because these aren't people who are okay with the problems that exist. So I am actually really excited about working with a new crop of leaders. I obviously will be a new leader to Lansing. But I want people who are thinking outside the box, who aren't committed to the old issues, but are willing to take the issue, look at it in a different way and propose new problems and hopefully get to a solution. Ed Moore: Okay. Speaking of long-term problems we are going to switch to roads and infrastructure. And our first question comes from Riley Beggin. Riley Beggin: Yeah, before I dive into the roads I just wanted to clarify about the term limits. You said hey, we have to do something about it. What would you recommend changing? Abdul El-Sayed: I do not believe in legislative term limits. I just think that we need -- I do believe in gubernatorial term limits. I don't think, the idea behind term limits was that you don’t' want people there long enough to concentrate power. Executive branch if you have got in effect unlimited set of terms that opportunity is high. But for most legislators that's not really the case and I do think that we do over time lose some of the insight that could be there. And it certainly we lose the ability to think long-term about what we are solving and what we really create big picture wins for the state of Michigan. So I do believe in abolishing state legislator term limits. Riley Beggin: Okay. With roads, we all know that they're bad here. A task force says the state needs $4 billion more just to maintain the infrastructure. How should Michigan pay to fix roads, bridges and water systems? Abdul El-Sayed: Yeah, so Riley, I think both of us were just talking about I drove about 35 minutes from Detroit. You drove from Lansing. I think both of us got a free back massage on the way. Look, we've got to do something about these roads. I do want to say something quickly though. Often times when we talk about infrastructure the roads are so bad that they dominate everything that we talk about. But we cannot talk about infrastructure without talking about water infrastructure that has left people in Flint still without clean water. That leaves people in Detroit liable to get water shut offs, shut it off in their home. Without talking about school infrastructure, without talking about energy infrastructure. So let's talk about roads and bridges for a second. But let's not forget these other aspects of infrastructure that are equally broken in the state of Michigan. When it comes to roads and bridges to me the responsibility is to be thinking about how we make long term investments and we make those investments in ways that are robust. And so we are not in the same position we always are which is in effect putting a band aid on a bullet hole, right? I know that if you put a bandaid on a cut that needs stitches that patient is going to come back to you not only still needing stitches but probably really sick because the cut got infected. So right now, the way we deal with our infrastructure problems is to get real hot and mad about them in February and March and then over the summer to do the basic minimum. So we got through the rest of the summer and the fall and then we are back to square one come the winter again. We are not investing enough and we are not investing over the long term. Our Pure Michigan Infrastructure Bank is about solving that set of problems. It's about creating a vehicle in state government that allows us to move beyond the usual political cycle. Allows us to invest in a big picture kind of way. Allows us to take funding from private sources to invest in private projects rather than what we have seen across Michigan right now which we have public investments in the private projects like the Little Caesars Arena or many of Dan Gilbert's projects in downtown. And allows us to think about place making in a comprehensive way. So when you are building roads there is a lot of stuff that happens under roads. Why can't we think about investing in all those things as a bundle? A Pure Michigan Infrastructure Bank solves that problem. Now the question is how do you pay for it? Well, one of the big reasons our roads are so bad is because we are a major trucking port. We have multiple ports to Canada and a lot of folks truck through Michigan. And we have not been asking those corporations who are trucking to pay their fair share for a long time. And I do believe we need to make the investment to be asking them over time to pay their fair share. And then we've go to be asking over the long term about how we think about how we think about collecting other sources of revenue. One example of this is legalizing marijuana. We know that there is about $125 million on the back end in terms of excess taxes and those are opportunities to really be making investments in roads as well. And then lastly let's also get past the idea that transit is limited to roads and bridges. One of the big issues that we have as a state and I talked to you about the importance of being able to keep our talent there in Michigan one of the big challenges that we have is that we don't have quality mass transportation. And because we don't have high quality mass transpiration we are missing out on the opportunity of creating coherent hubs across our metropolitan areas. It's not just Southeast Michigan where you could imagine connecting Detroit and Ann Arbor, the eastern suburbs and Oakland County and doing so in a coherent way. It's also the west side of the state connecting Kalamazoo and a Benton Harbor and a Grand Rapids. Or even the northern part of the state connecting a Traverse City to a Marquette to a Cheboygan. So those are opportunities that we need to be investing in and over time those kinds of mass transit investments I think are going to be able to allow us to make big economic investments in ways that even fixing our roads and our bridges won't. Riley Beggin: One quick follow-up to that. You mentioned asking like the trucking companies and other folks like that to contribute. Can you give us an estimate on how much? Abdul El-Sayed: Well, I think that's a much more technical question and I don't want to shoot from the hip, but it's going to be a big picture investment that I do believe these corporations are going to have to make in order to continue to use our roads. It's just fair. Riley Beggin: Okay. As the recovery efforts continue in Flint what have you learned about the situation there and how would that inform what you do as governor? Abdul El-Sayed: I sat on a childhood led elimination task force when I was health director in the city of Detroit around the Flint water crisis. And when I realized that state government wasn't actually serious about implementing a lot of the recommendations that the experts in the room had made I realized that there was a real responsibility to change leadership. It's a big reason why I'm running. And right now, four years on, regardless of what average water testing shows people in Flint don't trust their water because it's still not clean. You look at the housing, you go into the houses. You pour the water into a glass. It's still brown. People don’t trust that water and for a good reason. They have been lied to by state government for a very long time and the water just doesn't look clean. We have got a responsibility to get the lead piping out of the ground. That is a major infrastructure investment that we, as a state, need to make and it's not just Flint, it's also Detroit and frankly, any city that had much of its infrastructure built before the turn of the 20th Century. And so that's an investment that I am willing to really, really move forward on. I think there's a lot of Federal money that can be pulled down to make that happen. It's already there. But we've got to be able to cut through bureaucracy. I'm the only person in this race that has had the experience of actually cutting through bureaucracy in my role in the health department and I think I'm the right person as a doctor and as a former executive in the municipal government to be able to take Flint where it needs to go. And also to begin start looking at the bigger picture at what those kids are going to need over the long-term. As a doctor I can tell you that lead it is insidious in the ways that it competes for calcium in your bones. And so it sits in the bones for a long period of time. And the best thing we need to be able to do is to provide those kids access to universal healthcare over the long-term and cognitive stimulation in their schools. And right now, the kinds of investments that Flint schools need are massive. And that's why what we talked about earlier in terms of school reform is so critical. And I'm sure what we will talk about later in terms of health reform is also very critical. Ed Moore: Okay. We have passed the halfway point. But we're going to continue on with questions about water quality and that goes to Steve Carmody. Stephen Carmody: Obviously, many people in our audience have questions and concerns about the Great Lakes. In short, what would you do as governor to safeguard the lakes? Abdul El-Sayed: So number one, we've got to shut down Line 5. I mean this is the kind of conversation we can't keep dilly dallying about. And somebody who has worked in bureaucracy the thing that folks do to kill a project is to study it to death. And so you've got these other folks proposing study groups and working groups -- no. Shut it down and then let's figure out what we do on the back end. But right now, we've got a ticking time bomb. It's 15 years past when it was supposed to be shut down. We have had several scares in the last year alone. It's time to just get this right and to shut it down. Number two, we're watching as corporations have had their way with our Great Lakes for a very long time. And that's largely because under Republican leadership we have disempowered the Department of Environmental Quality that is supposed to be the regulator in protecting our air and water. Under my leadership we are proposing taking the Department of Environmental Quality, the Department of Natural Resources, building them together under one Department of Environment. Raising their funding from the 27 million that the DEQ gets right now, to 950 million. Giving them the capacity to investigate, the capacity to do research. And then ultimately pushing legislation that would give them the capacity to promulgate rules and to protect our air and water. One example of this, we've got Nestle Corporation. A Swiss corporation that's bottling our fresh water and let's be clear, all water is contiguous whether it's an aquifer or from the Great Lakes. Bottling our fresh water for $400 a year, right? In unlimited capacities. While people in places like Detroit are getting their water shut off because they got to pay $400 a month. It's not right. And we've got to stand up for our water. And then lastly, we have watched as the Federal government has made decisions about cutting really, really important sub agencies that focus on the Great Lakes and where they are going to let off we are going to have to stand up because let's be clear, the Great Lakes are 20% of the world's fresh water, 85% of North America's fresh water. We owe it to our children, our grandchildren but also to the world to restore this resource. Ed Moore: If I may follow up on the question of Line 5. I heard you say you wanted to shut it down, but then what is the alternative for moving those fossil fuels to its destination? Abdul El-Sayed: Why do we need to be moving fossil fuels? Look, the capacity to harness renewable energy and to store it has never been greater. We have the opportunity in the Keweenaw Peninsula alone to generate huge amounts of wind energy and we have the ability to leverage solar energy in a microscale in pretty unique ways. I really believe that in Michigan we've got to move in this direction. We can be a leader in renewable energy for a lot of reasons. The Pure Michigan Infrastructure Bank, would be a means to provide investments of really low interest loans for folks who want to build. The means to infrastructure of harvesting and storing renewable energies. And then we've got to push back on this lobbying that we've seen out of the fuel industry against net metering, which allows folks to harvest energy and sell it back to the grid. And then, look, we've got an opportunity because of our research and development capacities and because of our manufacturing capacities to be a leader in renewable energies nationwide and frankly worldwide. If we are serious about building really high quality jobs, if we're serious about building high quality infrastructure and we're serious about the environment I believe we can get to 100% renewable energy by 2030 and we can do it by making a targeted set of investments in renewable energy infrastructure, in a set of policies that force big polluters to carry the costs of their pollution and in building the means of financing the kinds of investments that we need both in terms of research and development through the industrial side and also through the harvesting and storage of renewable energies on the individual side. Ed Moore: Okay. And Hassan has a question about industrial chemicals. Hassan Khalifeh: How exactly do you intend to combat water contamination by industrial chemicals like PFAS? Abdul El-Sayed: The only way that we get this right really over the long term is to prevent it from happening in the future, right? That is the most important thing. Cleaning up is very, very hard to do. And yes, we need to make those investments. But unless we get serious about standing up to these big corporate polluters who have had their way with our air and water. We are going to keep watching these things happen. My mom, my step-mom grew up in Gratiot County Michigan. And her brother was affected by the PBBs poisoning in that part of the state because of Dow Chemical. And every year he has to go to the doctor and he has to get screened for the many different kinds of cancers that come because of that. Why did that happen? Because the State didn't take its responsibility to a regulation seriously. We are watching as Republicans are trying to strip away everything that the DEQ can do to even regulate in the first place. I mean they are trying to replace the DEQ's regulatory capacity with a commission of CEOs of industry, right? We know what decisions they are going to make. I mean right now the DEQ is headed by a former oil executive of BP. And we watch as the decisions continue to get made. When I was at the Health Department one of the most important things that we did was stood up to the DEQ and Marathon Petroleum when they wanted to raise their emissions of sulfur dioxide. And I couldn't believe that I was a health director was standing up and facing down a group of bureaucrats at the Department of Environmental Quality having to explain to them why raising the amount of sulfur dioxide in the air wasn't a good thing in a city with three fold probability of asthma hospitalizations in the state. It's sad to me that as a state that is defined by its fresh water we are the epicenter of water related disasters whether it's the Flint water crisis, whether it's the water shut offs in Detroit or whether it's PFOS in the water in communities across the state. I mean we've got to get this right. Hassan Khalifeh: How exactly would you give the MDQ -- DEQ the authority to do the things it should be doing? Abdul El-Sayed: So part of it is to build its budget out. Right now at $27 million it is one of the most poorly funded agencies in this state. And one of the most poorly funded departments of its kind nationwide. We've got to invest in it again the people doing the work. A part of it right now is that we are going to have to fight for legislation that allows it to promulgate rules. That allows it to actually say look, the intent of the law is this, which means that the application of the law ought to look in these following ways. Because now, it is kind of hamstrung. They are fighting the fight with one arm behind their back. This is not to call out the civil servants who work at the DEQ aside from the director of the DEQ, those folks are there because they believe in the work. But they just haven't' had the means to do the work either because of the legislation on the ground or because they haven't had the funding that they needed. So we got to fight on both fights. Ed Moore: Okay. We are going to continue with Hassan, but we're going to switch gears a little bit and move onto immigration. Hassan Khalifeh: Governor Snyder signed the or established the Michigan Office for New Americans in 2014, to attract and retain global talent. And he declared June as Immigrant Heritage Month this year. What plans would you propose to attract new people to come to Michigan given that we might lose a congressional seat due to the population decline? Abdul El-Sayed: I'm smiling because your name is Hassan and my name is Abdul. Our families came here because they believed in an America big enough for all of us. And we have watched as the Federal government has done everything in its power to marginalize and alienate people of color and particularly those from recent immigrant backgrounds. Whether it is what we saw a couple of weeks ago at our southern border people in our name using our tax dollars to rip children away from their families. Or a tax on things like the basic Visa programs that have allowed immigrants to come here and take high quality jobs that they are uniquely well suited for creating huge levels of economic activity in the process. We've got a responsibility to stand up for immigrants and for immigration because it has been the lifeblood of this country for a very long time. We believe in this idea of E Pluribus Unum, that out of many there are one. That notion of a country where people can come together beyond their differences, celebrating their similarities it is a unique thing we offer in the world and we are watching as the Federal government is stripping that away. What does that mean to me? Yes. I think some of these programs that the Sneider administration has promulgated they're good starts, but they don’t go all the way. Because unless you are willing to stand up for immigrants when they're being marginalized then you haven't done your job by them. Beyond that, I look forward to pushing forward legislation that would pre-empt localities from participating with ICE and using their local resources to do the same. Beyond that, we have also got to make sure that in this state we are not discriminating by documentation status. Right now, if you are undocumented you don't get access to a driver's license so you're stuck. You don't get access to a lot of the basic things the state offers everybody else and I think that is ridiculous. So we've got to stop discrimination -- discriminating that way. And I also believe that we've got to make sure that if we're honest and serious about empowering our immigrant communities then we've got to put some money behind making sure that folks have the access to be able to train in their profession of choice to be able to get relicensed to do what they do here in the United States. And in vest in basic things like English language training. I mean, we watch the state legislature push legislation that would make the official language of the state of Michigan English. Well, if that's the case then why don't we make sure that people are trained in English? We can't have it both ways. If you're honest about making English the language then let's make sure that everybody has access to learning English instead of just alienating people who look a little bit different or speak a little bit different. Hassan Khalifeh: Would refugees be a part of this plan? Abdul El-Sayed: Absolutely. I mean, people come here believing in the American dream and nobody believes in that dream like refugees do. Right? They are coming here because they believe in an America where they too can have a better life. And we as a country I believe owe it to the world to open our doors and we're better because of it, right? I never met an immigrant in my life who didn't want what's best for their family and what's best for our country. Immigrants are part of who we are and we got to stop alienating people who look a little it differently and we've got to remember who we are at core -- a place that believes in a set of ideals. We hold these truths to be self evident that all people are created equal. You take that seriously then that means that policy would have to follow that. Ed Moore: Okay. We're going to move onto taxes and tax incentives. And our first question comes from Riley. Riley Beggin: So one of our audience members, John, wants to know if you believe in economic development deals with tax credits, incentives if they are necessary and useful for Michigan communities. And since you've touched on that I'd like to also ask you to address you've brought up the MEDC quite a big and how cutting down on that would help pay for some of these other programs you are suggesting. So I want you to clarify would you eliminate the MEDC? Talk a little bit more about that. Abdul El-Sayed: We wouldn't eliminate the MEDC but under my leadership it's vision and values will change tremendously. Right now, the Michigan Economic Development Corporation, MEDC, is in effect a vehicle by which politicians who have taken oodles of corporate money, paid back their commitments. And they pay back their commitments in huge subsidies that leave many of our corporations subsidized by state government. Literally, not paying a dime because they're getting more in state subsidies than they were supposed to pay in taxes. That, to me is absurd. You know, we all heard about the deal hat MEDC tried to broker with Amazon, $4 billion dollars in tax revenue. I know a lot of things we can do with $4 billion and I also know that Amazon is not hurting for money right now. So it's crazy to me that we keep making these decisions as a state. The only way we create jobs -- and let me be clear about this -- the only thing that creates jobs are people who have great ideas with the capacity to turn those ideas into commerce because they can move themselves, their ideas and their goods and services around. We don't have that capacity right now in Michigan because we stopped investing in our people. We stopped investing in our infrastructure and instead we are hook, line and sinker allowing corporations to offshore and automate our jobs and subsidizing them to do that. Makes no sense. What does the MEDC do under an El-Sayed administration? MEDC becomes an incubator and a scaler for small businesses. It's focused not just on unemployment, but it's focused on median family income because unemployment is incomplete when people are employed but they are only half employed. So they still don't have the means of being able to afford the basic dignities of life. And so we've got to be able to invest in people that way and we've got to make sure that the jobs that are being created are jobs that are protected, that pay a living wage and where we're not busting unions in the process. And so I believe that the MEDC can be a great tool of good, but not the way that it is set up right now. Not one that while it's creating sweetheart deals that move our money out into corporate bottom lines instead of moving our money into investments of real people and not when it's ignoring small businesses who are the real job creators over big businesses that on net have not created a job for the past 10 years. Stephen Carmody:The economy is going well right now, but there's a likelihood that we will be in a recession sometime in the next four years. What can you do as governor to position the state so that it will be able to weather the storm? Abdul El-Sayed: Yeah. We've watched this happen, right? We know why the economy may face that kind of downturn. And let's be clear, you look at the numbers that we always look at for the economy, but in this moment of inequality unemployment rate is not the best outcome you can look at because too many people are under employed. They may have a job but they got to work two or three just to be able to afford the basic things of a dignified life -- a good meal on the table, a good roof over your head and some money you might be able to spend for money on the weekends, right? People don’t have that in Michigan. I honestly think that right now as much as folks like to say that the economy is back the Michiganders I talk to across the state aren't quite feeling that. And what we've seen is that even while corporate profits are up and unemployment is down labor participation at best in terms of access to the economy is stagnated and real wages falling. So the economy is not paying you what your worth anymore and so we've got to stand up for an economy that does do that. Ed Moore: Sascha Raiyn has another question that comes from our audience. Sascha? Sascha Raiyn: Our audience, Debbie and Ray, want to know about your plans for car insurance and specifically how you would lower the rates. Abdul El-Sayed: Yeah, well thank you, Sascha and thank Debbie and Ray for a really important question. I was just in Detroit today and in Detroit's 48227 ZIP code Detroiters pay five times the national average in auto insurance. We've got a plan to reverse the rates. It consists of four things: 1. No more red lining. Right now, we allow auto insurers to make decisions about what your rates are based on what job you work, what your education level is, your credit score and where you live. That doesn't make sense to me. The only thing they should be able to pay attention to is your driving record and whether or not you're over the age of 25. That to me is the only thing that should be taken into account when a decision is made about how much you pay. So we got to push the anti redlining bill that has been championed by people like Abdullah Hammoud, representative out of Dearborn. We've also got to stand up and build a truth in insurance commission. What truth in insurance would do is create the means of every day people to hold insurance companies accountable. Being able to say, how have you put together your rates? Why are you caring what you're charging? How much money is in the catastrophic claims fund? Right now, we don't have any visibility on that and the lack of transparency is hurting people. Three, We have watched as both the hospital industry and trial lawyers have taken advantage and exploited the system. Right now, the hospital industry can charge auto insurers well more than they would charge other sources of insurance for the same exact set of goods and that's not okay anymore. So we have got to establish a fee schedule that is stuck to by the hospitals. And then we've watched as trial lawyers have in effect exploited rules of accidents being able to charge auto insurance for legal fees and I just don't think that's right. And then lastly, the reason our auto insurance is so expensive in Michigan is because we're one of very few states that allows auto insurance to double as health insurance do. I believe in universal health insurance and I hope that we get to talk about our Michigan plan. And what Michicare would do is provide every Michigander access to health insurance so we can let auto insurance go back to being auto insurance again. We do those four things our rates come way down and we don't have these disparities in rates in different communities across the state. Ed Moore: Okay. We're going to switch our attention to mass transit and that's going to come from Sandra Svoboda. Sandra Svoboda: Michigan is a very diverse state between urban areas and a lot of rural areas as well. So I am interested in your ideas for transit throughout the state a little bit specifically in Southeast Michigan with the RTA. Abdul El-Sayed: Yeah. I think the RTA is a good start. I think whoever the next governor is has got to be willing to put a shoulder in to making sure that we get regional transit invested in. I believe our Pure Michigan Infrastructure Bank provides the right tool, so that the State comes in with some skin in the game. Like I told you earlier, the biggest competition that we have right now is the competition for young talent. And young talent keeps leaving because we don't offer the kind of lifestyle choices that young people are interested in. And those lifestyle choices often times are undergirded by the ability to move across different communities quickly. We don't have that in Michigan. I honestly believe that mass transportation is mission critical for the future of our state and I am committed to getting it done. Ed Moore: Okay. Hassan, questions about trade. Hassan Khalifeh: Canada is Michigan's largest trading partner, international trading partner. How do you think that the tensions between the Trump administration and the Canadian government might hurt your relationship between you and your counterpart in Ontario? Abdul El-Sayed: Well, let's be clear, we've got a president in office that does not understand the very basics of trade however much he likes to think about himself that way and is on pace to really, really hurt people in communities like ours. Because the sectors that are going to get pinched if there is a trade war are going to be agriculture, specifically, specialty agriculture which hurts Michigan farmers tremendously. I was just in Traverse City eating some cherries and thinking about what's going to happen to cherry farmers if this continues forward. And then manufacturing. And Michigan will really, really hurt if this continues forward. My job as governor will be to do the work of trying to ease those relationships and trying to move the leverage that we have at the state level to try and ease up what might happen if a trade war exists. Because let's be clear, I just won't have the power that he has at the federal level. And if he continues forward we're going to be in a world of hurt. But we have got a responsibility to stand up and I believe that working with other governors and working with other state leaders who recognize the consequences that this awful trade policy is going to have for their communities I believe that we have a strong voice to be able to advocate and get him to start paying attention to basic economics again. Ed Moore: We're coming up on a next topics, which is transparency. Before I move on though I wanted to pick up on the Michicare plan that you brought up. Could you please fill us in more on that plan? Abdul El-Sayed: Yeah. I'm a doctor and I believe in the responsibility of providing everybody access to healthcare as a human right. But here's the thing, we have an opportunity not just to provide all 600,000 Michiganders who don't have healthcare with access to it. All 10 million Michiganders with access to high quality healthcare, but the ability to save Michiganders money. Michicare is a single payer Medicare for all style healthcare plan. What this offers is every Michigander access to high quality healthcare that would reduce the costs of healthcare itself by cutting the insurance middle man out and by reducing the costs of things like prescription drugs because the State has the ability to negotiate on every resident's behalf. And reducing the cost of auto insurance as we talked about because no longer will you need auto insurance to be health insurance too. We're calculating that the average family earning about $48,000 a year would save $5,000. That's literally 10% of their take home every year in healthcare costs alone. But not only that, it's good for business. The way we would pay for it is through a progressive payroll tax as well as a gross receipts tax over $2 million. Meaning 75% of businesses aren't going to pay a dime. But even for big business this is a way for them to save money because every business over 50 employees they pay about 25 cents on the dollar for every dollar spent for an employee on healthcare for that employee. Imagine they didn't have to pay that anymore what it would do to free up businesses. So we estimated that you know, a company with 40,000 employees for example, save about $20 million. So every day Michiganders save money, our businesses save money. And we all know in Michigan the experience of having either lost a job in the last recession or knowing somebody who has. And that experience one of the scariest things about that is knowing you might lose your healthcare too. Nobody should have to go through that in Michigan. So we got an opportunity to stand up, to reduce the cost of healthcare, provide healthcare for every Michigander and potentially more importantly, create the kind of healthcare space that allows us to incentive prevention again in the health system and to provide high quality healthcare where we don't current have it because the market doesn't supply it in our rural communities where hospitals are shutting down and in urban communities where hospitals shut down a long time ago. Riley Beggin: All right, what's your stance on Voters Not Politicians initiatives? Abdul El-Sayed: I think it's amazing. Just look at its enemies. These are all people that have benefitted from a system that put corporations over everyday people. So I believe in voters not politicians. I cannot wait to vote for it. If I'm not governor even if it doesn't pass I will work to wed our system to independent bipartisan redistricting over the long-term because I will have oversight over the next redistricting process. It's time for us to break this system that has left us with one of the most unequal distributions of government in the country, frankly. We are the second most gerrymandered state in the country. And just to be clear for folks who don't understand exactly what this means -- we got 38 senators Michigan. 27 of them are Republicans. 11 of them are Democrats. And we all know that the vote doesn't go more than 45 to 55 either way in any given election. So we've got to stand up for a government that is actually fair where instead of politicians getting to pick what their voters are, voters get to pick who their politicians are. Riley Beggin: I want to ask one quick follow up on that -- if legislators are drawing these lines you said you would have significant oversight over it -- can you talk about what you would change? How you would do that? Abdul El-Sayed: Well look, I believe that we have got to go to mathematically independent redistricting and you know, however much legislators are drawing lines has got to come through my office to get okayed. And I am unwilling to pass a system that is not fair. And I'll be honest, when I say fair I mean not gerrymandered either way. We're at a crisis point in our democracy right now. And that crisis point is that people have stopped trusting in the institutions whether it be journalism and the voracity of the free press or the voracity of their vote in the democracy. Because we have seen people play on the edges right? And change the conversation in so many ways that are not good for democracy. I don't think it's good to be gerrymandered either way. I mean currently right now it's gerrymandered in favor of republicans obviously. But I wouldn't want to gerrymander it in favor of democrats either. Because democracy suffers when people don't believe in their democracy and don't believe that it's a fair and free process. And so we've got to stand up together and demand that our elections matter again. That people have access to the vote openly again and that the work that you guys do bringing light to our democracy is trusted and believed again. That's a lot of work. And so to me gerrymandering is one of the biggest enemies because it basically tells folks in certain communities that their vote doesn't matter. It becomes a culture of just not voting because you don’t' believe your vote matters. And we have got to address that and I think gerrymandering is one of the biggest reasons we are down this hole and we've got to get out of it. Ed Moore: One more question on transparency coming from Sandra. Sandra Svoboda: Picking up on that Michigan recently received the lowest rating in transparency among all of the states in a study that was done. So I'm wondering how much of an issue that is for you if reforms would be part of your administration, specifically, to the Freedom of Information Act coverage and campaign finance disclosure? Abdul El-Sayed: Yeah, Sandra, you and I both know that why exactly transparency matters because if you want to know what is happening in the governor's office good luck. You can't actually file a Freedom of Information Act request or what's happening in a Senatorial office. Under my leadership the minute I take office I am submitting my entire administration to Freedom of Information Act accountability and would seek legislation that opens that kind of transparency across the Senate and the Governor's office. That's number one. Campaign finance I think right now is the single most alarming issue in the state of Michigan. We watched as the Snyder administration signed into law a set of policies called Citizens United on steroids. And what's worse is we're watching as Democrats are using those rules corrupting a democratic primary through these vehicles that can take unlimited amounts of corporate money and not showing us where that money is coming from. I am the only candidate on the Democratic side that has fully complied with federal financial disclosures. Both Sarah and I -- my wife and I. And that is because we believe it's really important that people know where our money is coming from and that we're not bought. I don't take a dime of corporate money. I don't have a 527 called Build a Better Michigan that is running ads that may be breaking the law telling you to vote for me. Anything that I've collected has been from real people, individuals. And everything that you see about my campaign is paid for by my campaign. We've got to get the corporate influence out of our politics. It is one of the worst things about this moment that we're in. And we're watching both Democrats and Republicans play by those rules. And if you want to know who is going to solve it it's the person who has rejected the rules in the first place. Right? If you got there playing by those rules the likelihood that you are going to try to change those rules on the back end I don't see it happening. You benefitted too much. As for me, I'm not benefitting from those rules. I'm being perfectly honest about where my money is coming from. Neither Mr. Thanedar or Senator Whitmore have done this and you know, it shows. Both of them are millionaires. Both of them see politics in a particular kind of way. I don't. I was never supposed to run for office. To me as a public servant I saw the responsibility when I realized how much of a corrupting influence the corporate money had on our politics. You got a major in Detroit right now who got more money from people who worked for Blue Cross Blue Shield than the people who lived in the city of Detroit where he is mayor. Tells you something about whose decisions he's making. And so we've got a real responsibility to bring it back to government for people and by people. And I am deeply committed to do that both in the way that I am running and in the way that I will govern. Ed Moore: We did touch on marijuana a little bit earlier. I think Steve is going to drill down on that a little bit. Abdul El-Sayed: You had been touching on marijuana earlier? My eyes red? Stephen Carmody: As you pointed out Michiganders will be voting on legalizing recreational marijuana this fall. What's your opinion of it not only as a person who will be voting on it but s a physician? Abdul El-Sayed: Yeah. I believe that we need to legalize marijuana. I've never smoked marijuana just as a matter of personal choice, but I do believe that there are a lot of reasons why we've got to get out and we've got to legalize this. 1. It's a civil rights issue. If you are black in this country you are 3.3 times as likely to be arrested for marijuana possession just by no higher likelihood of use. And it is a big reason why that plus the war on drugs it is a big reason why we have seen a tearing apart of social fabrics in low income African American communities because of the system of laws on the books and the way that we police. It's not right. We have to upend it. I intend when legalization happens, I intend to both pardon and to push legislation to expunge records of non-violent offenses for marijuana possession. That's number one. 2. I'm a doctor. I remember seeing a patient, a 10 year old girl who had a seizure disorder and tried all the medications with all the side effects that came with them and the thing that worked was marijuana. The thing is that we don’t' actually know how to use it in what amount, in what delivery mechanism, in what regimen of use because it remains illegal for recreational use. And so we've got a responsibility to better understand cannabis as a medication and I don't believe that happens until we legalize it. 5. I think I'm on 6. Now, I just don't believe that marijuana is any more dangerous medically than alcohol and yet we regulate alcohol in a particular way and we regulate marijuana in a different way. And I just believe that we've got a double standard and that double standard doesn't really make sense. And so, I fully support legalization. But beyond that I do believe Michiganders are going to legalize. We need a governor who is thinking about how to make sure that we don't have a full on corporate take over of the marijuana trade pulling a lot of money out of low income communities where it had been in the past even if illicitly. Second, we have a really good opportunity to be able to stand up the ability to do some of this research in Michigan and as somebody who was NIH funded as a researcher I know how to do that and I think we've got an opportunity to set that up so that we are creating the kind of medical knowledge that benefits people in the state. So I look forward to a moment when the state stands up and does the right thing and legalizes. And I think we're in a good position to make sure that the use and the sale is safe and that the best benefit comes out of it. Stephen Carmody: Do you have any concerns about the potential social and health issues that may arise by having a broader access to marijuana? Abdul El-Sayed: Sure. Look, we've got to make sure that marijuana doesn't fall into the hands of children and we've got to make sure that people are not driving while intoxicated. The fact is keeping it illegal doesn't make that that much easier, right? And a lot of the research shows some pretty interesting findings. For example, the big question has been well, if you make marijuana legal is marijuana a gateway drug? And it turns out it's not actually the use of marijuana that is a gateway it is the doing of something illegal. And so once somebody has done something illegal and right now, recreational use of marijuana is illegal, probably that they are going to do something else illegal becomes a lot higher because you've already broken that barrier. So it's not the drug itself. It's not marijuana itself. It is the fact that we've created this artificial boundary by which marijuana is outside the bounds of legality. And so I think that there is a lot of potential benefit actually in terms of being able to prevent some of the other harder drug use and being able to actually be thoughtful about how we regulate marijuana from falling into the wrong hands in children. Or its use when people are operating heavy machinery or cars that I think it's a lot easier once you've made it illegal. Ed Moore: So not that the last hour hasn't been pleasurable, but we did want to wrap up on a few fun question if we may. Abdul El-Sayed: Those weren't fun questions? Ed Moore: You seem to be enjoying it so I won't take that away from you. Abdul El-Sayed: I'm having a blast. Thank you. Ed Moore: I'll kick off with the first one just a handful of them. What was your first job? Abdul El-Sayed: My first -- well, I used to wash, clean all the toilets in my house. I got paid a full dollar per toilet when I was in middle school. Stephen Carmody: Must have had a lot of toilets. Must have had a lot of toilets. Abdul El-Sayed: I didn't make very much money I'll tell you that much. But my first job was actually bagging groceries at Kroger. And I had that job and then from there I started I worked at a Bellacinos making sandwiches and pizza and from there I scooped ice cream at Coldstone Creamery. And then I got my first job as an instructor after that teaching organic chemistry at Michigan. I had a string of jobs that I really enjoyed and my first big purchase was a kit for my '95 Camaro that I thought I was really cool in. And so I worked really hard over the summer and was able to kit out my $4,000 Camaro. Sascha Raiyn: Well, so we want to know about the cars in your life. Tell us what you're driving and what your family is driving. Abdul El-Sayed: So I drive a Ford Focus. The thing about my Ford Focus though it has got a fantastic sound system. So it looks you know, you look at my Focus you're like okay that's a cool car. Doesn’t have very much room in it. I'm a relatively broad shouldered guy. But it's got a fantastic sound system. And so I really enjoy that car actually. That's a lot of fun. And that's my car. Sarah drives a US built Subaru and she got that car I think three years ago now. And those are our cars. Hassan Khalifeh: Just going back to the race for a second. Can you think of an interesting or touching moment along the campaign trail while talking to voters? Abdul El-Sayed: There are many. Running for office is really privileged work. And the reason I say that is because I'm a physician by training and one of the most beautiful things about medicine is that it is so human. The idea of healing somebody. And people trust you with things they don't tell anybody. Not even their closest loved ones they will tell you things. And running for office is similar because the reason as a doctor people tell you things is because they believe you can do something about it. And I take that so seriously. And in running so many people have come to me and said, I want to tell you about this thing in my life. I won't tell anybody about it. I remember being in Grand Rapids and we were at a -- we had our debate and I was at the watch party after the debate. And this woman came up to me, she had bit tears in her eyes and she said, "I just want you to know why I'm here." I said, why? She said, "I'm the mother of an eight year old boy who has beaten cancer twice and I don't want to watch this kid become an adult and then realize that that kid is going to be bankrupt because the cancer comes back. And I'm here for Michicare and I'm here because I believe you are willing to stand up to those corporate guys, who we've had to fight so many times to get him the care he deserved. And I believe that you are willing to fight them for kids like him." And you know, on my best days I try not to think about the gravity of that and the trust in that. But it gives you a lot to think about. And people are really struggling. And so I am deeply thankful that they would trust me to share this information with me and to believe that me and the movement that we're building have the ability to do something about it. But there's not a day that goes by that I'm not touched by the lives that people lead. And sometimes really hard. And sometimes fun. You have kids come up to you -- I had this young woman named Elise, who made me a it was an outline of an animal. And the animal was different parts. One was air and water and one was housing and this other and she said, "People just deserve to have these things." I couldn't connect why it was in the outline of an animal, but I appreciated that it was. And it's now up on the office in our up on the wall in the office. Ed Moore: Next question is from Riley. Abdul El-Sayed: You know, I'm reading a biography of Leonardo DaVinci by Walter Isaacson. And I usually, I really like to read political biographies. I've had enough of politics as you can imagine why, so reading about somebody else by a biographer that I really enjoy is somewhat fun. And the thing I really appreciate about DaVinci is he just had this rare ability to connect different ideas in his mind. I'm a scientist by training and that's how I sort of see the world. And venturing into politics and policy has been a really empowering moment for me because you take the same skillset as a scientist to sort of deconstruct the system. When I was a professor I wrote a textbook on system science and public health and it basically takes this approach to science that says that traditional science assumes that the part you just put the parts together you make the whole. The whole is just the sum of the parts. And system science says that actually the whole is greater than the sum of the parts. So it has been fun for me as a scientist to take that systems approach to thinking about things like schools and the economy and infrastructure and think about how actually, the whole is greater than the sum of its parts. DaVinci was a genius for his ability to do this. And so I like to just read about folks like him and say well, you know, what if anything can my small brain do to wrap our minds around these aspects. It has been a fun read so far. Abdul El-Sayed: Ice cream. I really love ice cream. I went to, so I've been all over the state and one of the funnest parts about traveling the state is that I try and have ice cream everywhere I go. It hasn't been so good for my waistline, but I enjoy it. And I think I found potentially the best ice cream in Michigan and that was at Moomers in Traverse City. I you have never been to Moomers in Traverse City it is amazing and we just went two days ago and I had two amazing flavors. One was a chocolate cherry pecan chunk and the other one was this thing called Cherries Moobilee. And they were both some play on chocolate nuts and cherries, which is just fantastic. And the cool thing about Moomers is if you go in the summer you get to watch the cows whose utters created the milk who created the ice cream. It's like a meta experience. Stephen Carmody: You're not always campaigning. I know you are right now, but you haven't always done that. When you have a weekend what do you like to do on the weekend? Abdul El-Sayed: I've got a seven month old girl and she is everything to me. And any of my waking moments that I'm not doing this I am trying to be with her and spend some time with Sarah as well. I've been married for 12 years. I joke I'm 33, but I've probably lived the life of like a 53 year old. And really for me it's just I love to be with her with both hers in my life my wife and my daughter and we often enjoy going to visit my parents and we actually live with her parents. Most of my waking moments are spent with family. I really enjoy travel. I love meeting people and connecting with people from different backgrounds and perspectives and seeing the world for a moment through their eyes. And seeing the things that are different but more often seeing the way things are the same. The way that people love and cherish their families and connect to their foods and their cultures. And that has been part of the fun of campaigning as well. And I really, really enjoy sports. I was an athlete my whole life growing up. I played football, wrestled and played lacrosse in high school, played lacrosse in college. I don't connect to my athletic self as much as I wish I could. I just don't have the time. But some days when I'm working out of my basement I like to pretend like I'm working out for something other than so I can eat more Moomers. Ed Moore: Okay well that -- thank you very much for your time today. That concludes our conversation with Democratic candidate for governor Abdul El-Sayed. Many thanks to the John S. and James L. Knight Foundation for our support. And on behalf of the Detroit Journalism Cooperative, I'm Ed Moore. Thanks again. Yes. YES. YES!!!!!!!!!! Finally - someone for the people! Education: Candidates need to stop blaming education problems on things like charter schools, tests and teachers. Parents and voters want a vision for improving educational outcomes for all kids. Michigan needs a system that puts kids first, not bureaucracy, we need to give teachers freedom to teach and we need to give every parent the chance to send their child to the best school possible. That’s what charter schools do. All charter schools are public schools, non profit. Some charter schools contract with companies to provide goods and services to the schools. Some of these public schools are the highest performing schools in all of Michigan. They do it with less funding and with higher percentages of kids living in poverty. Charter schools aren’t political to parents. They shouldn’t be political to anyone else either. I'd like to see someone from the Muslim Brotherhood in office personally and if we had one at the top post in Michigan that would be amazing. Praise be...praise be (LOL - A Handmaids Tail). While i could state the obvious --you are attempting to taint this candidate with some religious nonsense--i'll just cut to the chase. Mr El-Sayed does not run on a religious platform. Neither does he attempt to dis any other candidate's campaign by referencing any religion. If you look close, you'll notice that A Handmaid's Tale takes place in a nation under the control of Christian fanatics, not Moslem (tho it's true when it come to religious fanatics, one is hard-pressed to tell the difference). I appreciate the articulate components of the clear priorities Abdul presents, especially his goals for education and health care for working class and children. He's got my vote.